In a large mixing bowl, combine the ground beef and the chorizo. In a blender, add the onions, black pepper, salt, cumin, and garlic and mix at medium speed adding water. Pour the blender mixture into the beef mixture, mix well, and form into burger patties by hand. To make the chipotle mayo: Using a blender, mix the mayonnaise and chipotle pepper on low speed. Cook burger on a skillet, grill pan, or grill to desired temperature. Butter the buns and heat in the oven for 5 minutes. Spread chipotle mayo on both halves of the buns. 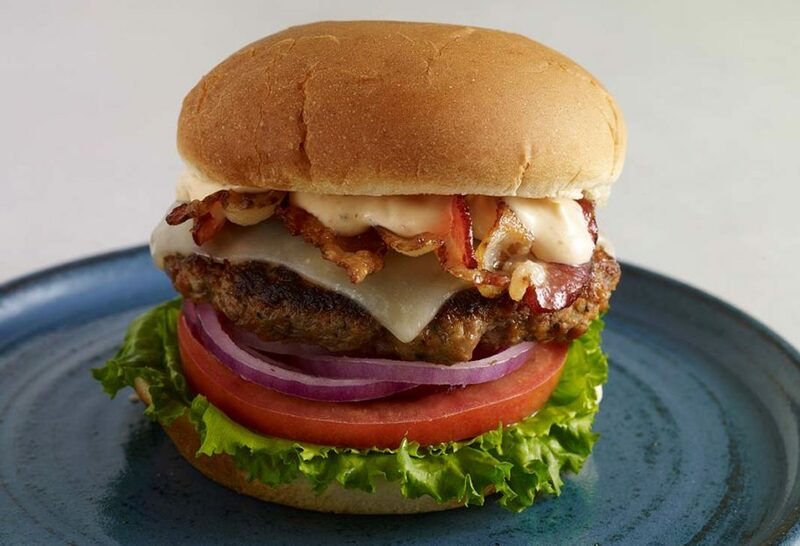 To assemble burger, start with the base of the bun and layer on the lettuce, a slice of tomato, sliced onions, the cooked burger patty, pepper jack cheese, cooked bacon, and the top of half of the bun. Made these last night, they did not disappoint. Delicious! I cannot wait to make this for my husband. He was watching your show with me and was so impressed – we were recently in DC visiting our daughter we went to Mission Restaurant- it was wonderful!! Looking forward to your next season! Hope your husband loves the burgers Maria! This looks delectable! I’m saving your recipe to make soon…I’m a cumin addict!! Thanks for sharing. I hope you love it as much as me Kelle! the chorizo burger looks good. I make a burger with half beef half pork. I then add cooked thick cut maple bacon to it cooled and add chili powder to it and cook them.